The first and only 0% interest installment payment financing solution offered on your customer’s existing credit cards. Unlike consumer financing, no credit checks or third party applications are required. The consumer can easily charge any purchase on their existing credit card and receive instant approval at checkout, all while paying it back in monthly interest-free installments. Businesses worldwide can offer Splitit installment plans to consumers from any country and capture business regardless of location. 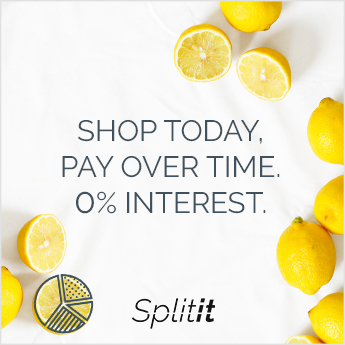 Splitit integrates with all major credit card processors, gateways and shopping carts around the world so you don’t need to change your current set-up. Maximize Average Order Value and Conversion! Why Offer a 0% Financing Option? Attract more customers using “As low as… per month” pricing as a marketing tool. Plugins available in Shopify, Magento, & WooCommerce app stores. Instantly split orders into smaller monthly payments on your customers’ existing credit cards – no credit checks, no applications. By offering an affordable monthly payment option that fits any budget, you instantly increase your customers’ purchasing power. Interested in learning more about Payment Financing?